Few players have achieved the near-mythical status associated with Pete Maravich. Generally viewed as one of the most innovative offensive players in NBA history, "Pistol Pete" cards and autographs are in high demand. Shop for Pete Maravich Cards on eBay. Pete Maravich first emerged on the major basketball scene during his time at LSU. Playing for his father, who was the head coach, Maravich averaged over 43 points per game during all three varsity seasons, a fact made even more impressive since the three-point line had not been instituted. 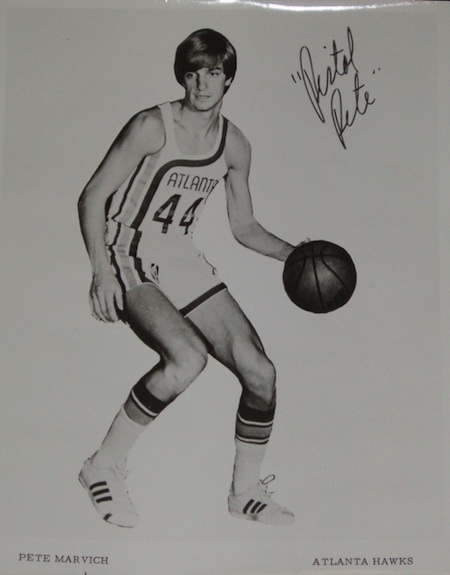 After finishing his collegiate career, Maravich declared for the 1970 NBA Draft and was selected third overall by the Atlanta Hawks. Maravich would go on to play ten seasons in the league, spending most of his career with the Hawks and New Orleans Jazz. 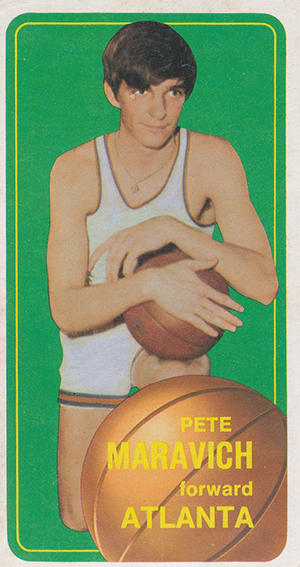 Regular problems associated with his knees slowed "Pistol Pete" in his later years and forced his retirement in 1980. He ended his career with five NBA All-Star appearances and was the scoring champion during the 1976-77 season. Pete Maravich was inducted into the Basketball Hall of Fame in 1987. Less than a year after he was inducted into the Hall of Fame and only eight years removed from his retirement, Pete Maravich died from a heart attack at the age of 40. For this reason, the supply of Pete Maravich autographs is very limited. Obviously, this has pushed his certified autographs to higher values and has resulted in a greater interest in his signed checks and other documents from his estate. Although very rare, Pete Maravich game-used memorabilia items carry an incredible premium whenever they appear for sale. While there is only one Pete Maravich rookie card, Maravich's career coincided with a consistent basketball card period, so there are multiple base card options for collectors throughout the 1970's. As the sole Pete Maravich rookie card, this tallboy card has added importance for collectors. 1970-71 Topps utilized a bright green background for Maravich's card. The card also includes a fresh-faced image of Maravich, holding a basketball on his knee, and a generic look without any Topps or NBA logos. 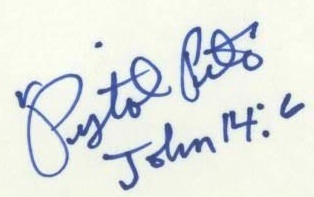 Below you will find an example of what Pete Maravich's authentic signature looks like. This can be used as a first point of reference for determining the legitimacy of autograph memorabilia, but is not a substitute for having your items authenticated by a well-respected professional autograph authentication company. Reputable authentication companies include JSA, PSA and Mounted Memories, to name a few. It is important to note that there is not a huge supply of Pete Maravich autographs due to his sudden death, early in 1988. It is highly recommended to only buy authenticated Pete Maravich autographs. Pete Maravich has been known to sign a variety of ways, including Pistol, Pistol Pete, Pistol Pete Maravich, Pete Maravich and Peter Maravich. "Pistol Pete" appears to to be the most common. The signature is legible and each letter can normally be distinguished. When he signed Pistol Pete, Maravich included quotations that frequently appeared as random dots at the beginning and end of the signature. The "P" normally exhibits two rounded parts, similar to a "B". From there, the first name is completed in cursive and the "i" is normally dotted. The second "P" is similar to the first and the "t" is more rounded and resembles the "l" in his first name. Occasionally the "t" is crossed straight from the final "e" without lifting the pen. My friend, I was looking for an opinion on a Pistol Pete sig I have. I think it is worth looking at. kevin � PSA or JSA is your best best for authenticity questions. 1974-75 PETE MARAVICH TOPPS # 10 SGC 84 JAZZ BASKETBALL ! !